ProArteDanza beautifully re-imagines ‘The Marriage of Figaro’ (Le Nozze Di Figaro) in Figaro 2.0 at the Fleck Dance Theatre. Taking on the large task of a three-hour opera, award-winning co-choreographers, Roberto Campanella and Robert Glumbek create a gorgeous and witty ninety-minute contemporary dance work. Figaro 2.0 is based on the comic opera, composed by Mozart in 1786. The story has many twists and turns following misunderstandings, manipulations and infidelities. I highly recommend reading the program synopsis before viewing, as it is helpful with the complex storyline. Although it’s not required as the brilliant design of the show will help you along the way. In short, Suzanna, a servant to the Count, is set to marry Figaro despite her Count’s efforts to seduce her. Meanwhile, Figaro must go to trial over past debts to which the cost is marriage to a different woman, Marcellina. All the while, Suzanna works with the Countess, Rosina, to catch the Count in his infidelities. ProArteDanza is one of Canada’s most highly regarded contemporary ballet companies. Their works are incredibly technical and fiercely physical. This work is no exception; however, with the added narrative, the company is brought to new heights. Audiences are able to better connect with the dancers, their characters and storylines as I witnessed in the ‘question and answer’ period after the show. The audience and cast talked about the themes in the work in relation to the ‘Me Too’ movement, and how it affected the creative process, as well as the dancers personally. The whole cast take their characters head-on, from the powerful and emotional female characters, Victoria Mehaffey (Suzanna) and Kelly Shaw (Countess), to the hilarious Ryan Lee (Marcellina), playing an over the top female character. Lee has been one of my favourite dancers in the city for a long time, and it is nice to see him in such a witty role. My only wish would be for him to have more stage time. The projections, by William Mackwood, enhance the plot and bring the opera into a contemporary storytelling. 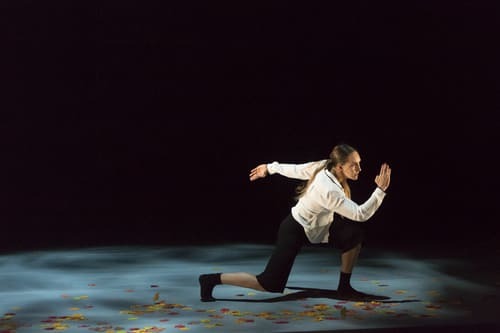 I generally get nervous when narrative dance pieces have written projections, as I find it tends to tell too much of the story rather than leaving it to the characters and choreography. However, the projections in Figaro 2.0 are perfectly placed and only add to the beauty or wit taking place on stage. Memorable moments include a female duet in which they write a note to the Count, their bodies follow the cursive writing projected behind them. Later, the projection are used comedically, as they create thought bubbles above characters heads proclaiming their states of hunger or frustration. When asked what made the co-choreographer take on this large project, choreographer Roberto Campanella quickly stated ‘alcohol’, to which the audience laughs. Although as he continues to talk, with dramaturg John Ottmann, you see why they were the perfect company to take on the challenge. I highly recommend seeing this show before it’s gone. Figaro 2.0 is playing at Harbourfront Centre’s Fleck Dance Theatre (207 Queens Quay West, 3rd floor). Show runs November 1st to 3rd and November 7th to 10th at 8:00pm. Tickets are $27 – $50 (discounts for students, seniors, arts workers and groups). Tickets are available by calling the Harbourfront Centre Box Office (416-973-4000), or online. Photo of Kelly Shaw by Aleksandar Antonijevic.